There’s an old adage that pretty much holds true whichever sport you are discussing: a playoff series doesn’t really start until one team wins in the other’s building. Well, ladies and gentlemen, we have a series! With Jeff Carter back in the lineup, the Los Angeles Kings sent a message loud and clear, that the second season is all that matters now, defeating the Vancouver Canucks 4-2 in the Great White North on Wednesday night. After all it was Carter and Mike Richards just a few years ago, who played on a low-seeded, underachieving Philadelphia Flyers squad, that made a run to the Stanley Cup Final. 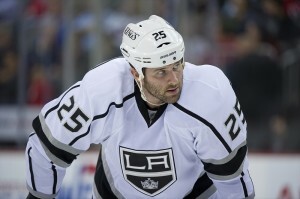 Appropriately enough, it was Richards getting to work in Game One against Vancouver. Vancouver did get the scoring started in the first period. On a play in the defensive zone, it looked like Jonathan Quick was interfered with by Ryan Kesler, but nothing was called and Alexandre Burrows would cash in for the Canucks to give them the early lead. The seemingly rattled and undisciplined Canucks committed a slew of penalties after that initial tally, however, and it ended up proving costly. With a 5-on-3 power-play, Richards caught Vancouver and Roberto Luongo off guard, zipping one off Luongo’s pads and in to the net to tie the game. In the second, ill advised decisions would once again prove costly for the Canucks. Byron Bitz smashed Kyle Clifford from behind and into the boards for a five-minute boarding major. On the ensuing power-play, Willie Mitchell blasted on home from the point and the Kings had their first lead of the evening. Vancouver would rebound late in the period, as Alexander Edler drew the Canucks even with a clutch goal with just under eight seconds to go in the second. The action went back and forth for much of the third period, but as the period wound down, the Kings came through. It was the much maligned Dustin Penner, tipping home a “pass” that redirected off the skate of Carter, for the go-ahead goal. Also assisting on the goal was Richards, who registered a three-point night with an additional helper on Dustin Brown’s empty netter that sealed the victory for LA. Overall the Kings out-shot (39-26), out-hit (28-26) and blocked more shots (19-18) than the Canucks. They may tell it differently in Vancouver, but given the time the Canucks spent on the penalty kill, if it wasn’t for Luongo, things could’ve been much worse for the President Trophy winners.